I read this article and found it very interesting, thought it might be something for you. The article is called The Power Of Leadership Culture: How Leaders Set the Tone and is located at https://teamperformanceus.com/2018/09/power-of-leadership-culture/. As a leader, are you permitting or ignoring bad behaviors? Do you find yourself giving some high performing workers a “pass” when they treat people with lack of respect? Do you tolerate negative behaviors to keep the workplace peace and maintain status quo? “The way things are done around here” is one way that culture can be defined. A default culture is easy. In some workplace cultures, people may get away with bad behaviors and not hold members accountable because they in turn don’t want to be held accountable. Oftentimes, leaders put the bottom line before the people. Doing so can have a negative effect on the people and the culture. Consider this: if we already know what’s bad for business and the culture, why do we continue to tolerate the toxic culture? At some point, when it’s clear that things aren’t working, motivated leaders decide to clean up the culture and do something different. Oftentimes, leaders reach a point where they have had enough and are ready to start their journey. I assert that this path of self-reflection and creating a conscious leadership style and culture is the path least traveled with the biggest rewards. Once started on the path of personal growth, the journey becomes the reward. I was visiting with a client who is in the middle of a transition because she works in what she considers a toxic culture. The culture is fear-based and uses tactics such as making employees sign non-competes or risk being fired. Certainly, there is another way. She is a brilliant millennial willing to do her work and grow into a powerful leader. This company is losing valuable talent by not taking care of its people. The culture of an organization is a direct reflection of the personal styles of the leaders. Leaders must align and be on the same page for it to filter throughout the organization. Organizational transformation always begins with the personal transformation of the leaders. Below is a map that was developed by Richard Barrett at Barrett Values Centre. It is one way to look at how you see yourself and others as a leader. Where are your strengths? Where would you like to grow to be better? What would the people that you lead say about your leadership style? What styles would inspire and motivate your employees and other leaders? TEAM Performance helps leaders grow into the positive aspects of levels 1, 2 and 3 and develop new behaviors to support levels 4, 5, 6, and 7. This translates into moving from crisis management to being inspiring, visionary leaders. 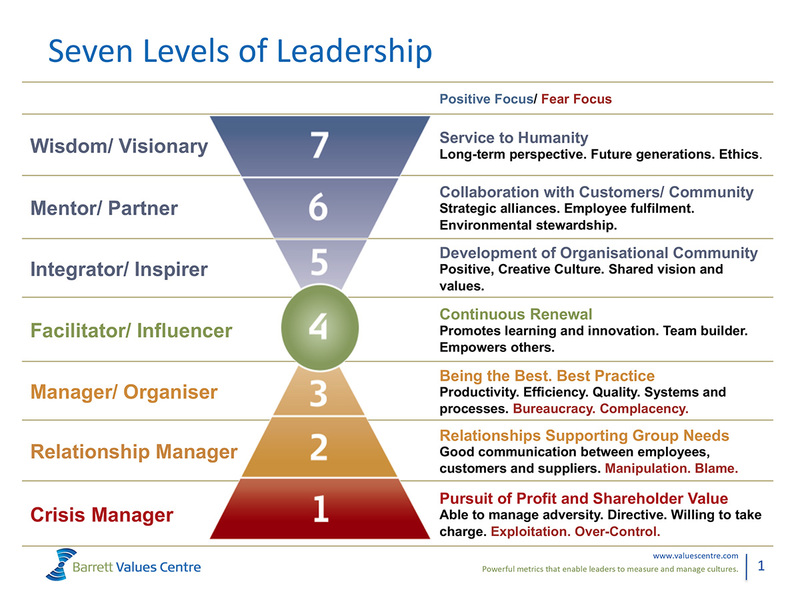 From my point of view, one of the biggest shifts that a leader needs to make in the Barrett Model is when moving from level 3 to 4. This transformation could be compared to that of a butterfly metamorphosis; the greatest period of transformation occurs in the middle portion and what emerges after is a renewed being, in a sense. This transformation period requires that a leader bump up against resistance of old ways of being. Learn how the Leadership Values Assessment can help you grow into the leader you want to be. 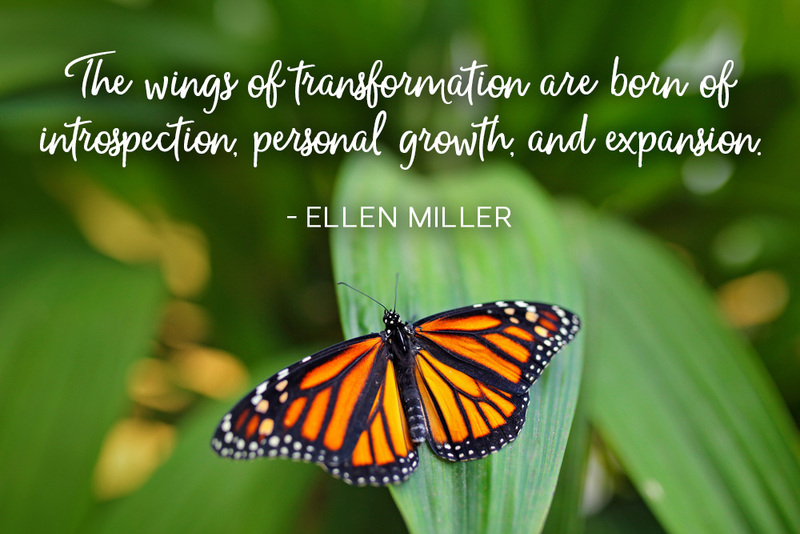 “The wings of transformation are born of introspection, personal growth and expansion”. Feedback is the breakfast of champions. I invite you to do a checkup from the neck up by assessing your leadership effectiveness with this free Leadership Self-Assessment. It is your birthright to be all you can be! Reach out to grow and expand. TEAM Performance is here to walk that path with you so you can be all you want to be. This time is now!